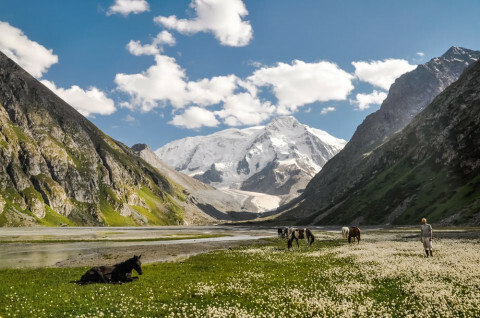 This week's Publisher of the Week takes us to Kyrgyzstan where author and photographer Stephen Lioy shares his routes in ViewRanger. Happy exploring! Summary: Stephen Lioy is a Lonely Planet author and tourism development consultant based in Kyrgyzstan. Over the past few years, Stephen has been traveling through the spectacular mountains of Central Asia, taking beautiful pictures and creating routes. Stephen Lioy says: "I'm a travel photographer and writer based in the Central Asian city of Bishkek, Kyrgyzstan. Though I'm passionate about culture, nature, and travel; photography has come to define my travels as one central focal point to express appreciation for the incredible world we live in. I grew up and went to college in Louisiana and initially left the USA to move to China, but after a year and a half there departed to wander down a path that would eventually lead to Central Asia and Bishkek." "One of the absolute best routes I've uploaded is the Ak-Suu Transverse, a 107km crossing of some of the most beautiful sections of Kyrgyzstan's Ak-Suu region from little ecotourism village Jyrgalan through to the red cliffs of Jeti-Oguz, with several beautiful lakes and glaciers along the way." Favourite Feature in ViewRanger: "Find Routes - sometimes a guy needs to daydream from an office chair, you know?" More info: Check out Stephen Lioy's personal website with some beautiful photography at www.stephenlioy.com and a traveling blog at www.monkboughtlunch.com. ViewRanger is an open platform for writers and publishers to share their favorite places ranging from everyday adventures to far-away dream destinations. Learn more at: https://www.viewranger.com/partners/publishing-routes .